Of course it’s insanity in the current financial climate to suggest that the Met should have done a new production of La fanciulla del West this year, even though it’s a very special case: the centennial of the work’s world premiere, which was also the Met’s first world premiere. 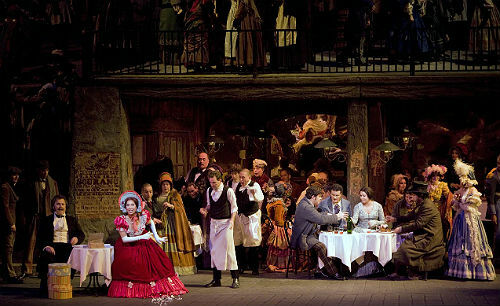 In fact, to replace a production of a Puccini opera after only 19 performances would seem foolish even in an era of unbounded prosperity just about anywhere except the Paris Opéra, where the rule is that when a new intendant takes office he is supposed to junk everything this predecessor did, especially the successful stagings. But even though the sets and costumes for the Met’s Fanciulla are in tip-top shape, this production doesn’t revive well, or, let’s just go ahead and say it, it never really revives in the sense of actually coming (back) to life. 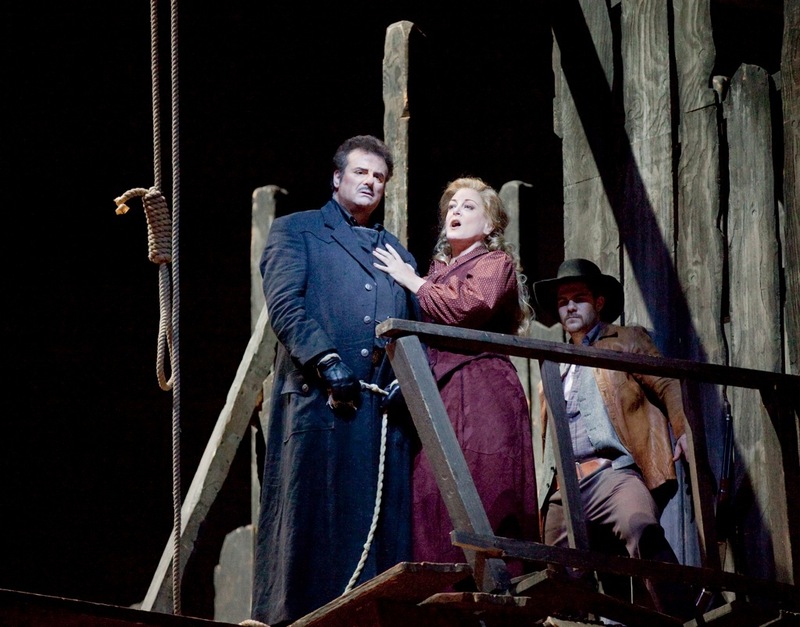 The main culprit here is director Giancarlo Del Monaco (and by extension, his enablers Plácido Domingo, Joseph Volpe and Mrs. Donald Harrington), since, like the other four Del Monaco stagings at the Met in the early 1990s, this Fanciulla concentrates on massive naturalistic sets and superficial coups de théâtre at the expense of subtle characterization or, for that matter, clear storytelling. This should be a surefire moment; in fact, until recently this entrance would get a big hand for the leading lady’s first appearance. But a simple two-man standoff isn’t enough for Del Monaco; he has to fill the stage with a full-scale bar brawl in cliché western movie style: guys being thrown over the bar, chairs smashed over heads, even a stuntman crashing through a second story balustrade and plunging into the melee—or, as it happened on opening night, a stuntman accidentally fragmenting the breakaway railing long before his cue and then simply diving off the balcony so he could collect his check for the stunt. Other than that gaffe, it was dazzling, all right, and expensive too, but it was nonsense. The other men at the bar have no particular stake in a personal argument between Rance and Sonora. Oh, they might egg the two on, or try to break them up, but why would they start randomly punching whoever happens to be handy? It was like something out of Blazing Saddles. But, more importantly, the point of the fight, which is to build up tension for Minnie’s entrance, was lost, because the brawl was so elaborate and eye-catching that her arrival, even after she fired off her rifle, was invisible. (It was literally that from where I sat; Deborah Voigt was singing her second phrase before I was able to locate her.) So, for the sake of an irrelevant and illogical “moment,” the protagonist’s character-establishing entrance was obscured. There are plenty of other problems with this production, none of them quite deal breakers, but still troubling enough to raise the question, “why did Del Monaco expend money and time on this peculiar, ineffective choice?” Why, for example, is Johnson still onstage at the act one curtain, when the stage directions call for him to exit? Is he supposed to hear Minnie’s sigh? (Marcello Giordani showed no sign of reacting.) Is she supposed to know he’s still there? (Voigt made no such indication.) So if Del Monaco has no good reason for Johnson to remain, why not just let him leave per the stage directions? Why is the act two set designed so that the entire left half of the stage is devoted to an exterior outside Minnie’s cabin where practically nothing happens besides a long and visually distracting snow flurry? Why must Johnson’s hanging be located on the second-floor balcony of an abandoned building far upstage, which means that once again Minnie’s entrance is flubbed (how did she arrive on the second floor of the building without anyone on the street outsice seeing her? ), and Sonora is stranded so far upstage that his cathartic phrase “Le tue parole sono di Dio” gets covered by the orchestra? And why, for the sake of finishing the opera with the image of Jack Rance alone and sobbing, must the miners all follow Minnie and Johnson offstage and (presumably) into Arizona? But a broader question here is the advisability of attempting naturalism in so essentially unrealistic a form as opera. 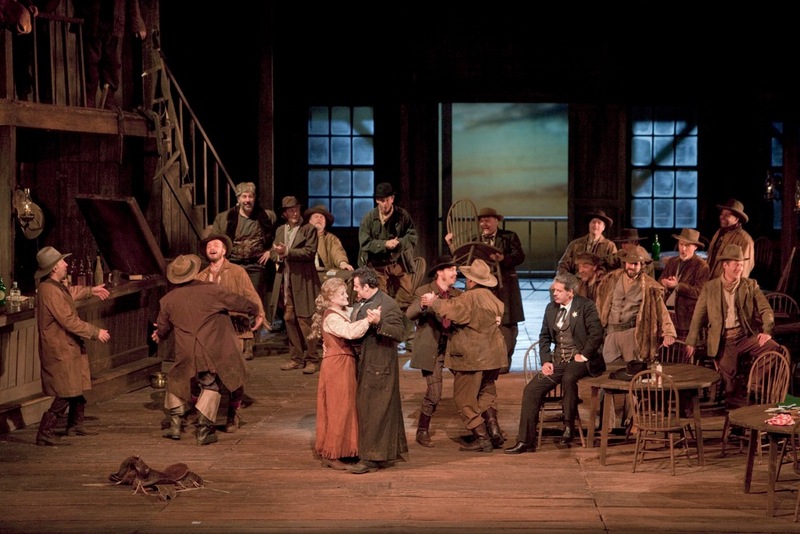 This Fanciulla arrived at about the peak of the “bigger is better” naturalistic period at the Met, when the gold standard was (as, to some observers, it still is) Franco Zeffirelli’s fantastically detailed 1981 Bohème. The difference between a Zeffirelli (who designs his own sets) and a Del Monaco (whose Met productions always were collaborations with Michael Scott) is that Zeffirelli has an aesthetic, painterly eye. He selects his details meticulously, creating a stage picture that is in effect an enormous collage of three-dimensional objects and two-dimensional trompe l’oeil trickery. Del Monaco, in contrast, just seems to want real walls, real trees, real staircases, literal copies of real-world objects. But my eye, at least, confronted with what purports to be reality, tends to seek out precisely those details that reveal the illusion: the way a supposedly massive door delicately flutters shut like the balsa wood it actually is. Paradoxically, then, by trying so hard to make Fanciulla look real, Del Monaco succeeds only in making it look fake. And now, after 20 years, it looks faker than ever. 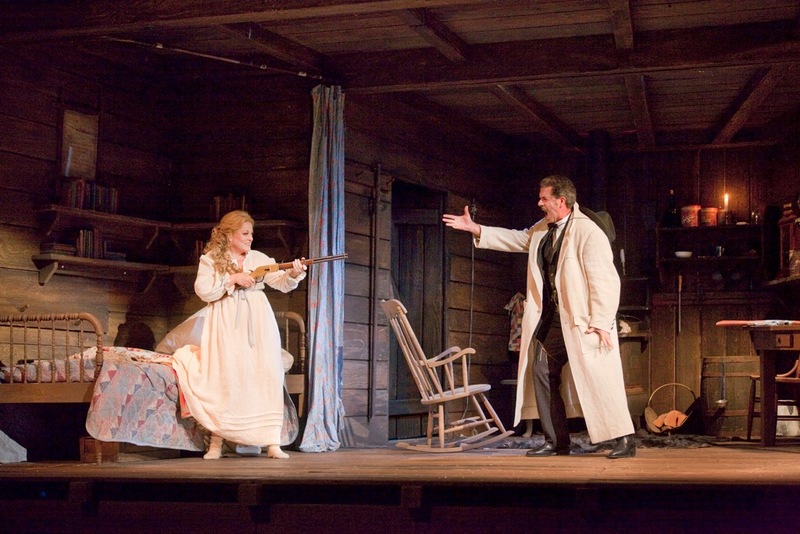 Photos: Ken Howard/Metropolitan Opera (Fanciulla); Corey Weaver (Bohème). This entry was posted on Friday, December 10th, 2010 at 4:54 pm	and is filed under Rough and Regie. You can follow any responses to this entry through the RSS 2.0 feed. Both comments and pings are currently closed.